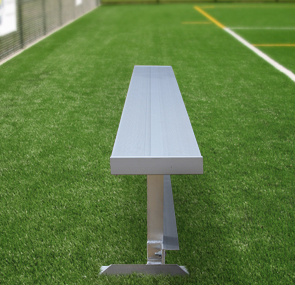 The Team Series aluminum player benches feature 2" x 10" extruded aluminum seats and galvanized or aluminum frames. Frames are available in portable surface mount or permanent in-ground styles. Included galvanized hardware will not rust like zinc-plated hardware. These series of benches do not come with a backrest. See matching products for Team Series player benches with backrests.